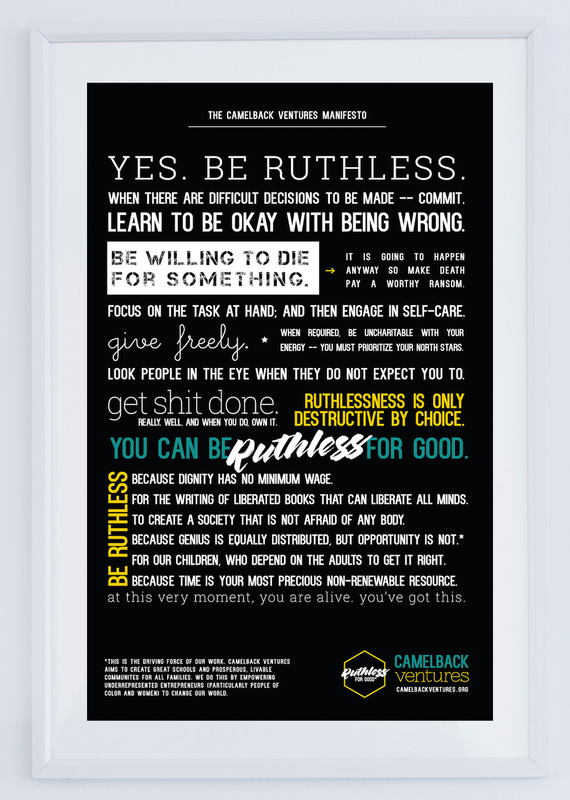 This piece is a part of Camelback's Ruthless for Good series, sharing different ways that individuals embody the spirit of our manifesto and what they fight for. It is also our flagship post for our 2018 MLK celebration. 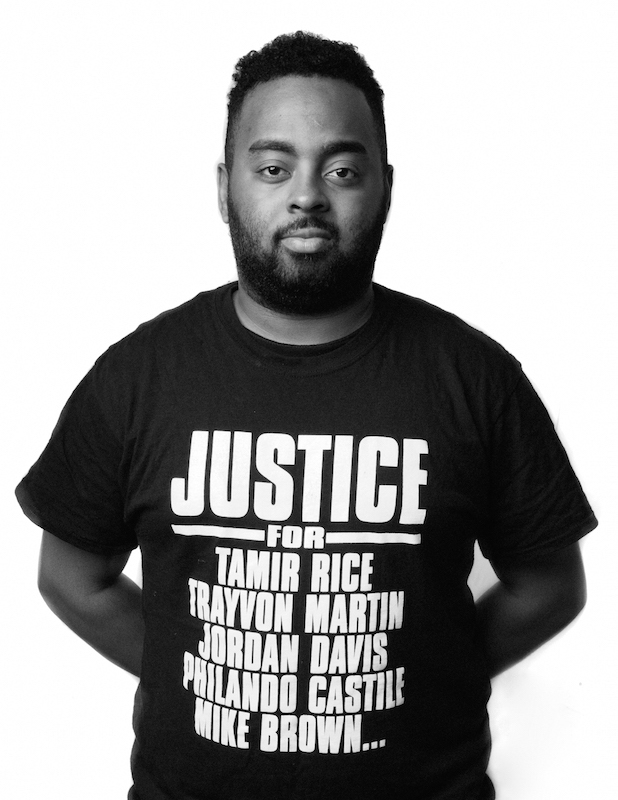 Vincent Cobb II is a 2017 Camelback Fellow. I am the co-founder of The Fellowship for Black Male Educators. My personal favorite Black male educator? That’s easy. Mr. Brian Freeland, 7th grade social studies. His approach to education felt radical. What happened in that classroom was more than just school -- it was life. Sure, he taught us the content we needed to know for an exam, but he also taught us about materialism and sweatshops. He challenged us on youth culture and what we thought we believed in. He pushed us to study indigenous cultures and their modern day struggles. In most schools and classrooms, you get a great book, and the teachers teach the book. But he challenged us to think beyond texts and about the world. I remember him claiming, “I’m going to sue P Diddy. Because P Diddy is selling out dreams, and y’all believe it.” It wasn’t stern or lecturing, but a gentle, firm idea to question our ideas of success and value. He thought we weren’t too young to see the world for what it really was, and demonstrated that there was a calling for us to make an impact. He was the kind of man who stood on top of desks, textbook in hand, speaking emphatically about morality. Mr. Freeland made me realize how engaging education can and should be when it is made personal and relevant. Mr. Freeland was always unapologetic. I wanted to be like that. Because accountability and advocacy for our communities need to happen, and to make change, we have to be unapologetic. We have to be ruthless for good. I was the first in my family to go to college. I realized quickly what a transformational experience it would be not only for myself, but for my family. I became obsessed with eliminating the barrier of entry and creating access for other young people. I started a program called Empowering Minds to encourage “at-risk” high school students to see college as a real possibility. That summer, we hosted a residential program for Black and Latino boys in their junior and senior year of high school. We coordinated summer college classes for them, scheduled them to regularly meet with mentors and explore career options. Directing that program was one of the hardest jobs I’ve done in my life. It was a new level of responsibility that I wasn’t prepared for, and tensions were high on our team because everyone really cared about the kids we were serving, and so every mistake was that much more serious. It felt like if we didn’t do right by these kids, if they didn’t take the right courses or have a good experience, then we would be affecting their future. We had an end of summer banquet for the students, teachers, and families. As the director, I started to give a speech, talking about what an experience it had been and all that classic end-of-program stuff...when the 40 Black and Brown male students interrupted my speech and handed me a book. In the book, they each had taken a page or two, and wrote how I changed their lives that summer. It sent me to tears. I literally had to leave the stage and lock myself in the bathroom. This experience fundamentally changed me. This was the impact I wanted to have every day of my life. I went back to campus that fall, and changed my major from pre-med to education. My path didn’t stop there -- I went on to pursue my master’s before becoming a teacher myself. Every time I have a bad day, I like to say that I blame it on those kids. At every turn in my life, I took that pivot to pursue the next level of how I thought I could improve and support communities of color. The next major pivot happened soon after I completed my graduate degree and joined Teach for America. The Philadelphia corps of Teach for America had 100 members. Only four were Black men. I was one of them. To me, this felt so wrong. And it’s not just TFA. Nationally, LESS THAN 2% of educators are Black men. This information needled at me -- especially as researchers have begun to study the effect of teacher diversity, with studies indicating that diverse teachers improve academic performance of students, particularly for minorities. Since many of us are fighting to close the achievement gap, the 2% fact caught me as something we should be taking more seriously. So, I submitted a proposal for an internal TFA black male educator event that would have elements of recruitment and peer support. At that time, the program just didn’t have the resources or sustainability to handle the kind of project I wanted to create. My proposal was rejected. I had all but given up. It was around that time that, through all of this pitching and networking, I met Rashiid Coleman, a fellow Black male educator at a nearby school. He sat me down on the couch one day and said, “I know you didn’t get the grant. I know you didn’t get the support you were hoping for. But you need to do this. 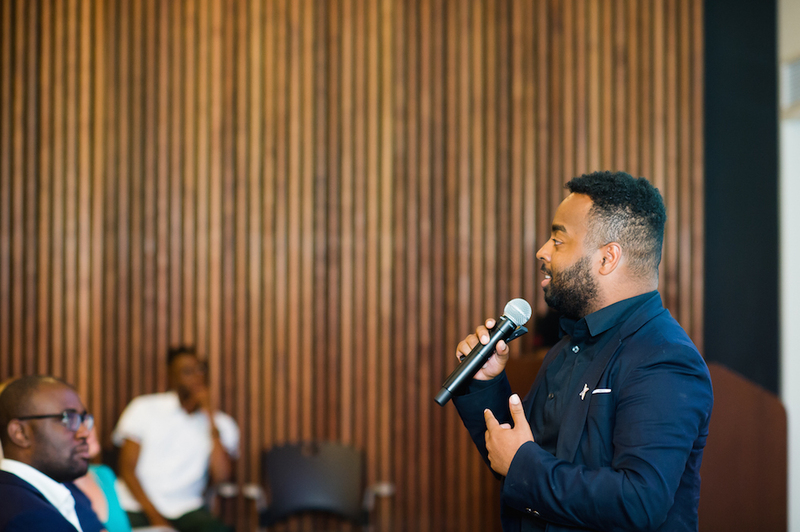 You must keep going.” He set up connections, got us a meeting with the mayor’s office, introduced me to my mentor Sharif El-Mekki, an education veteran and well known principal, and it led us to a convening of seventeen Black male teachers to pitch ideas about impacting the wider ecosystem on this issue. One of them was mine, BMEC -- Black Male Educator Convenings. Without Sharif’s mentorship, I don’t know if I would’ve had the courage to keep going. Walking into that convening of 700 people who cared about diverse teacher leadership floored me. It meant that it wasn’t just me and my idea. It is a real need, and people are with me. Last year, we tried something else exciting. We wanted to do something for the first day of school. We asked Black male educators in the area, any who were interested, to show up early at a few of the local schools, all suited up, and greet the kids. We didn’t have a grant or any funding to pull it off, but we had one superintendent on board, and we just thought we’d try it. We called our friends, professors we knew at colleges, put the word out on personal Facebook pages. We were hoping to get 30 people. Five HUNDRED showed up across the ten schools that reported in. Principals told us they couldn’t even keep track. The press was in a flurry to take pictures. You see, there’s no bigger statement for kids of all races and all genders to see a line of Black men in suits giving you high fives and cheering tunnels and congratulating you on your first day of returning to school. That’s their first image, and it is incredibly important, especially given how the media often portrays Black men. That’s indelible. I don’t think those kids will ever forget that, and that’s what this work is really about. Students told us that they now anticipate it, that their friends from other schools wished they could have attended. We can’t wait to do it next year. Sterling Grimes, the teacher featured in the video, has been on our leadership team from the beginning. He’s been teaching for 8 years, and is a TFA alum. We love him, the kids love him. He’s real, and people respond to that. I think it’s important for us all to keep student voices in mind -- so much of education work is done by adults, but about kids. Going into the video, we actually didn’t know what the students would say -- maybe they would say, “Hey, it really doesn’t matter about his identity,” and we’d go okay that’s good, and just cancel the whole org. But it was the opposite. They just naturally opened up, without any prodding or guidance from us. We just asked, “What does he mean to you?” It was actually hard to cut things out in editing. This video went viral with over a combined 10,000 views (in multiple channels) in a week, which is crazy for a small, new nonprofit. The video gave us the traction we needed and the ability to share both perspective of teachers and students. Today, the Fellowship for BME brings together current Black male educators, community leaders, and supporters. But our program also focuses on creating pathways for more young Black men to choose education as a career path, and we have an amazing team that includes student ambassadors. Every day, I am grateful to wake up and do this work. I wish people, including my people within these communities, knew that there is so much brilliance in our communities. I know that poverty and structural barriers to quality of life really put people in positions where they’re just trying to survive from day-to-day. But there is untapped brilliance and resilience, and if we can tap into that potential, we will be a community that can truly advance equality, a true America with the ideals of what it should be. There is a strong entrepreneurial movement in communities of color. When you’re from the hood, you know how to be innovative, you know how to make it work. People have great ideas but they don’t know how to execute it or they don’t have the resources or relationships -- we don’t have that generational wealth and knowledge. But I ask, are we content with this? I say no. I will always acknowledge my own privilege. And the fact that somehow I’ve been adopted into this entrepreneurial community, both with the Fellowship for BME and the Camelback Ventures community. I don’t think I’m different or better than anyone else, but I think I’ve been able to get into a particular position to be able to execute and build. I wish that opportunity was available to everyone. How different would our national community be, and our world be, if everyone had their chance to contribute their genius to the greater world? The resources, the training, the network, the investment...Camelback provided the kind of hands-on education that turned out to be exactly what I needed. I didn’t even know I needed it. I was trying run the org the best I could, but I didn’t know anything about running a non-profit or a small business. I was just trying to go along with this organic movement we were building in Philadelphia, and if it wasn’t for Sharif, I wouldn’t have applied to Camelback. The first thing that drew my eye was the $40k -- but wow, this was so much than that. I feel like I’m in a family. I I feel like I can’t fail because people have got my back. There is a moment I will never forget in the hours before our graduating Camelback Showcase. I was practicing my pitch with Michelle. I didn’t even make a formal intro of myself, and I just launched into describing my venture. She interrupted me and said, “NO. You are the CEO of the Fellowship for Black Male Educators.” I laughed. She said, “No. Say it. Own it. Say it. Say it again.” And I did. That experience to me defines Camelback. It’s about owning your place and getting what you need to make your dream a reality, to not be afraid to show that you know what you know. I see the Ruthless for Good manifesto as a calling that will help us all on our individual climbs. We may fumble sometimes, but the manifesto keeps it centered that yes, these are risks, but they are risks for the greater good. And if you’re pursuing good, then in a sense, you can never really fail. Failure would be not trying at all. Camelback’s manifesto and the ideals it shares drive me towards the idea that something is possible. It gives me comfort that others have gone through similar experiences as me, that there are people serving thousands and thousands of people. If we could make a significant, positive impact on local communities and school districts, then we have the potential to change the narrative for our nation and, by extension, the world. These are big ideas, and the manifesto is one of those things that keeps me inspired. I am ruthless for advocating for students in public schools who have a dream like I did, who need the mentorship and support and guidance that I needed. I am ruthless for the kind of impact that happens just in one summer, the kind that results in forty boys telling someone how their lives were changed forever. If you are reading this, it is because you have a dream. Perhaps it is like mine, a version of MLK’s dream that was not just racial equity and civil rights, but economic and academic equality. If you are starting something, believe in yourself. Just that. Believe that you’ve earned it. Be unapologetic about earning it. Don’t waver. If you do fail, fail beautifully. Make sure that you are the most idealistic you can be, the most crazy. Honestly, those are going to be the ideas that come full circle. People might not believe in you. BMEC was a failed grant. Someone else told me I had to believe in myself. I kept going. And today, I’m living my best life, fighting for educational equity. Don’t listen to people who say you’re not ready, that you’re not good enough, that you need to learn more, that you’re not qualified. There’s no time for naysayers when you still have a dream. Find a supportive community, and believe in yourself. Believe that you are meant to be here and to make this world a better place. Be ruthless. Learn more about Vincent's work with The Fellowship for BME. Learn more about our MLK celebration and read other Fellows' stories on how they're Ruthless for Good. Our application for the Camelback Fellowship is open. If you have a dream like Vincent and want to build your education org, please consider applying.